You realize you’re sitting under a giant statue of Ho Chi Minh, right? You’re citing a non-example example? 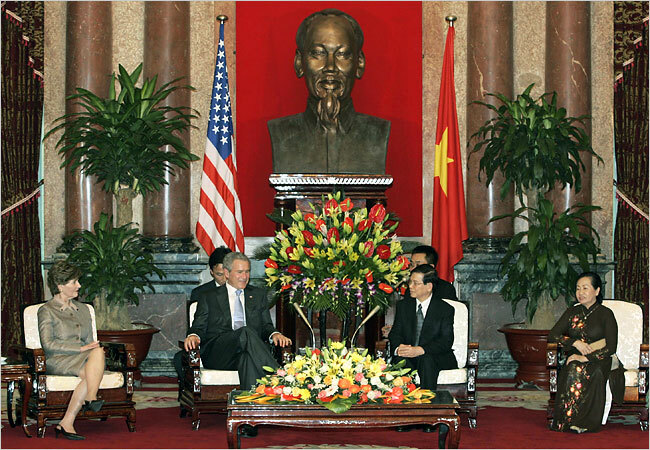 President Bush is in Vietnam saying the lesson of ‘Nam is “we’ll succeed unless we quit”??? While simultaneously hailing the communist government as a great success?! If an author had penned this as fiction, he would be laughed out of his chair for something so unrealistic and bizarre. MY G-D, THE IRONY IS SO INTENSE IT’S EXCRUCIATING! Why can’t journalists even mention how insane and incoherent Bush’s “lessons learned” from Vietnam are? Why is this not treated as a major gaffe? What the hell was he trying to convey? Why is he in Vietnam lauding them for their newfound love of capitalism if he thinks we never should have abandoned the Vietnam war and is saying “we succeed unless we quit?” Can he really have this level of cognitive dissonance? I don’t understand why he doesn’t realize we lost Iraq for the same reason we lost Vietnam: we didn’t have the troops to hold territory nor prop up a regime the indigenous population didn’t want. If the population doesn’t want it, we can’t make it happen. But yeah Mr. President, if we just send our boys into the quicksand for another decade or two, the Sunnis fighting for the return of the Caliphate and the Shias fighting for the Islamic Revolution will begin to just lurrv representative democracy, right? And does it bother anyone else that our leadership is now in bed with China and Vietnam, the new capitalist utopias where most of the stuff we buy is made using slavery, child laborers and exploitation in sweatshops? And if China and Vietnam have now fused the totalitarianism of Chairman Mao with unfettered corporatism, how is that not fascism? I don’t know whether to cry or to LMAO.